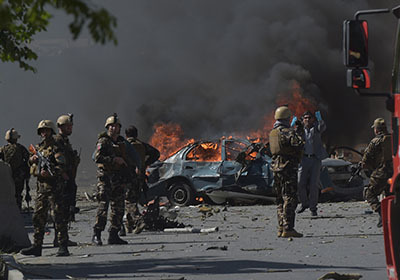 Another devastating suicide attack in Kabul on Tuesday and an independent report on the situation in Afghanistan serve to underscore what is now a growing consensus in Washington: that the United States is making no progress toward ending the 17-year-old war there. More than 50 people were killed and at least 80 others injured when a suicide bomber blew himself up inside a wedding hall in the Afghan capital, according to reports. This comes as a blow to the Trump administration’s strategy in Afghanistan, as American military officials had made defending major urban centers such as Kabul from the Taliban a linchpin of the effort. Just days before the bombing, America’s top general admitted the war is at an impasse. The Taliban is “not losing right now, I think that is fair to say,” Gen. Joseph Dunford, the chairman of the Joint Chiefs of Staff, said during the Halifax International Security Forum on Nov. 17. Meanwhile, the U.S. Defense Department’s Office of Inspector General on Nov. 19 released a gloomy report on the fight in Afghanistan for the second quarter in a row, citing little progress toward reconciliation. Operations in the country drew particular scrutiny over the past month after a high-profile Taliban attack in the southern province of Kandahar killed an influential Afghan police general and the local intelligence chief, narrowly missing U.S. Gen. Scott Miller, the new commander of U.S. and NATO forces in Afghanistan. In the midst of increasing violence, the U.S. envoy to Afghanistan, Zalmay Khalilzad, reportedly held three days of talks with the Taliban in Qatar over the weekend. At a news conference in Kabul on Sunday, Khalilzad struck a decidedly more optimistic tone than his military counterparts on peace efforts—though he did not mention the talks in Qatar. But the peace talks have sputtered and stalled in the past. While military leaders over the summer lauded a brief cease-fire between the Afghan government and the Taliban over the Muslim holiday of Eid al-Fitr in June, the Taliban did not reply to Afghan President Ashraf Ghani’s offer to implement a second cease-fire. Instead, the Taliban focused on disrupting preparations for the October parliamentary elections, according to the Inspector General report. James Dobbins, a former senior U.S. diplomat who served as special envoy for Afghanistan and Pakistan from 2013 to 2014, said there has been little progress in the past decade on bringing peace to Afghanistan. “Particularly for the last decade, we face a basic dilemma, which is that the best we can do is sustain the status quo—and that’s not a very satisfactory goal,” he said. Meanwhile, the picture on the ground is increasingly dismal. For the past year diplomatic and military leaders have insisted that they are making headway toward the goals of the South Asia strategy, which in addition to defending population centers also includes airstrikes on Taliban narcotics labs and other revenue sources. The end goal is to pressure the Taliban into engaging in peace talks. In July, U.S. Secretary of State Mike Pompeo said “the president’s strategy is indeed working,” and Gen. Joseph Votel, the commander of U.S. Central Command, later expressed cautious optimism. Speaking to reporters in August, outgoing commander of U.S. Forces-Afghanistan Gen. John Nicholson also said he believed the strategy is working. But the numbers suggest otherwise. In addition to the most recent Taliban attacks, the branch of the Islamic State militant group in Afghanistan, known as Islamic State Khorasan, continued to mount deadly assaults in its stronghold in Nangarhar province and in Kabul, according to the latest Inspector General report, which covered the period between July 1 and Sept. 30. The number of suicide attacks increased by 38 percent between May and August compared to the same period last year, although there was a slight decrease in the number of overall security incidents. Meanwhile, there was an uptick in both civilian and Afghan military casualties. Sixty-five percent of Afghans live in areas under government control or influence, a figure that has not changed significantly in two years. The commission (Commission on Wartime Contracting) last week issued a blistering interim report to Congress: "At What Risk? Correcting over-reliance on contractors in contingency operations," which concluded that "misspent dollars run into the tens of billions" out of the nearly $200 billion spent on contracts and grants since 2002 to support military, reconstruction and other U.S. operations in Iraq and Afghanistan.